I joined the BCCLA as Community Lawyer in September of 2017. As part of my position, I will be working with communities in northern and rural British Columbia on the relationship between Indigenous communities and the RCMP. Part of our work in community will include providing workshops on rights in respect to encounters with police. On my first day on the job as Community Lawyer at the BCCLA, I boarded a 42-seat turboprop for Haida Gwaii. While I had never been to Haida Gwaii, I had studied the landmark Supreme Court of Canada case of Haida Nation v. British Columbia (Minister of Forests). That case affirmed that the government has a constitutional duty to consult and accommodate First Nations where government action affects Aboriginal rights and title in First Nations territories. The Territories of the Haida Nation include the entire lands of Haida Gwaii, the surrounding waters, sub-surface and the air space. The waters include the entire Dixon Entrance, half of the Hecate Straits, halfway to Vancouver Island and Westward into the abyssal ocean depths. (a) The Haida recognizes the independent and separate jurisdiction of the Kaigani Haida. With this in mind, I landed in Masset in the late morning, where I met our Acting Litigation Director, Caily DiPuma. We were in Haida Gwaii to introduce the BCCLA to citizens of the Haida Nation, and to learn about their relationship with the RCMP. This visit is part of a long-term initiative of the BCCLA to work with indigenous communities in respect to their relationship with the RCMP in northern British Columbia. We were joined in Haida Gwaii by two representatives of the Civilian Review and Complaints Commission, the civilian oversight body for the RCMP. Over two days, we held meetings in Old Masset Hall in Old Masset, and at the Haida Heritage Centre at Kay Llnagaaynear in Skidegate. 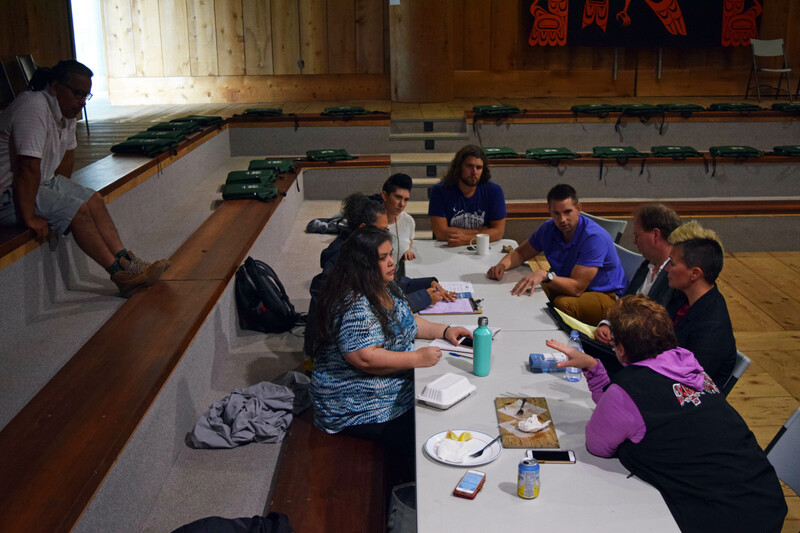 We met with members of the Council of the Haida Nation, restorative justice workers, and community members at-large. 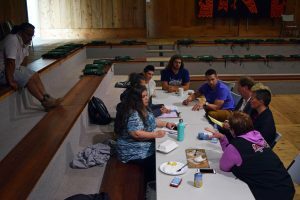 Journalists from Haida Laas, the newspaper of the Council of the Haida Nation, reported on the meetings. For the most part, we sat around tables and listened. What we heard in Haida Gwaii is what we have heard in other communities; the nature of the relationship between the community and the police comes down to the openness of individual officers. When officers are open to learn from the community, the relationship is good. When officers are not, the relationship worsens. This is frustrated by the RCMP’s policy that officers are on a two-to-four-year mandatory rotation, which means that the composition of RCMP detachments on Haida Gwaii are constantly changing. We heard stories of officers who were well respected by the community, but these officers were not there for long. Following our meeting in Old Masset, one of the restorative justice workers suggested we accompany her onto the streets of Masset to meet some of the men and women who hang out on one of the corners of Main St. We handed out pizza and sandwiches, and heard about their encounters with police. Several people told us about repeated harassment by police on the streets, and a couple people told us about mistreatment by police in the jails. One of the people we met mentioned the problem of “street checks” (a.k.a. “carding”) that citizens of the Haida Nation have experienced in other cities and towns in British Columbia. Street checks is a policing policy or practice when a person is stopped, questioned, and asked to show their ID. Police often do this for no specific investigation, but simply for general intelligence gathering. One of the problems with this practice is that there are many concerns that it targets racialized communities. Question: Do you have to identify yourself to the police? you are issued a ticket by police. For example, for breaching a municipal by-law. What we say to people who we work with is that, even if you are not required to identify yourself to police, you may want to in certain circumstances. Use common sense to decide whether to identify yourself or not. If you decide not to identify yourself to the police, say, “I don’t believe I have an obligation to identify myself. Am I free to go?” If you choose not to identify yourself, it is very important that you simply do not identify yourself. Do not lie or pretend you are somebody else. As we continue to work with communities, we will continue to talk about our rights in respect to encounters with the police, specifically in the realm on racial profiling by the RCMP. We are grateful to all of the people we met on Haida Gwaii, especially to our hosts in Old Masset and Skidegate.